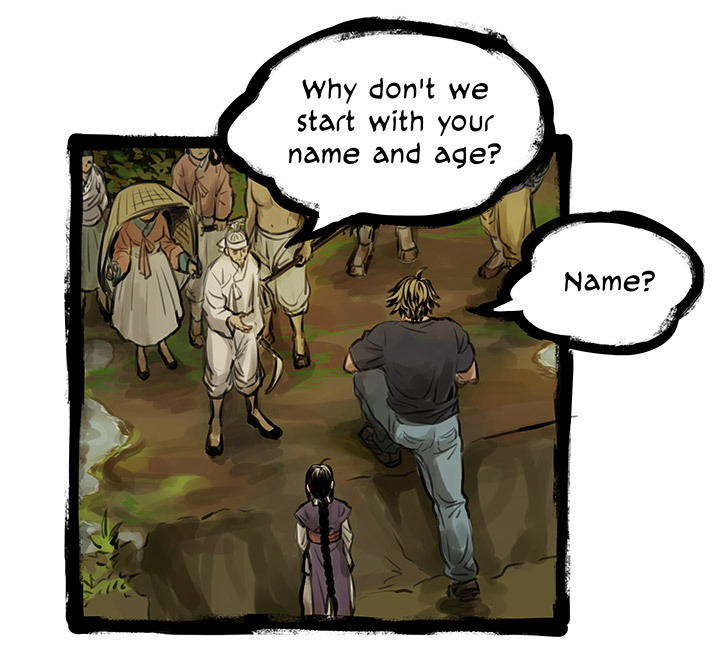 I’ve gotten positive responses on the font used on the previous strip, which is awesome! But some people found it just a little too hard to read, so here’s one that feels similar, but should be easier to read. I hope. All English fonts and bubbles updated up to this point. English: beige and brown, Korean: black and white. So many hours I’ve spent on font browsing and tweaking… So much comic I could’ve drawn with that time! I’ve had a sub on this for some time now, and I’ve been meaning to sit down and catch up. Well, here I am. Holy wow, what a beautiful comic! The painted-looking quality is amazing! I’m also loving the “stranger in a strange land” take here. Now, about this specific page… Poor guy. I can’t help but be reminded of the old Alien Nation TV show, where our main human protagonist’s last name translated to “excrement cranium” in the alien language. It’s good that the villagers are no longer ready to attack him! But feeling sorry for him is still a definite improvement over the original hostility! 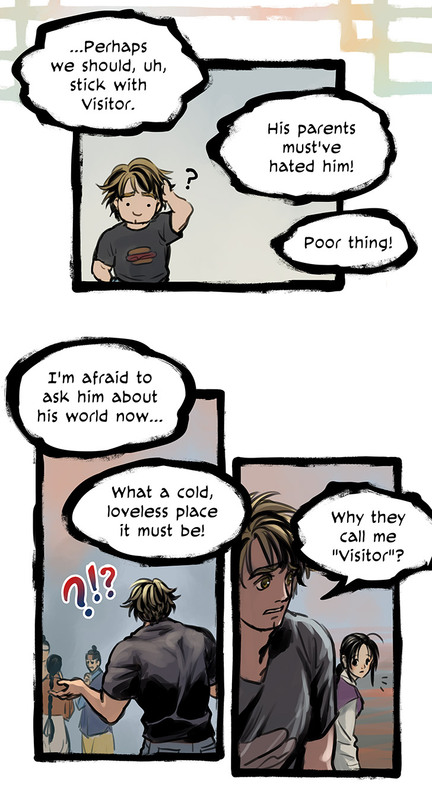 8’D It’s great that the misunderstanding was cleared before any harm came to him, ohoho. Ethan’s a pretty big guy, eh? ovo Reminds me of what my dad said about going to Japan, where his size drew a lot more attention and stares than usual. Average height differences! Aaaaa! Yup! I think Koreans are a bit taller than the Japanese on average, but these people are slightly shorter than modern day Koreans. The average adult male is around 5′ 6″. Flip the numbers for Ethan: he’s 6′ 5″ and hasn’t finished growing. He’s 19 and will grow two more inches in his lifetime. He’s also really REALLY beefy for 19. When he reaches his mid-to-late 20s, he’ll be freaking huge unless he actively controls his exercise/diet against it. And yeah, it'll be a problem for him in most structures. And not just with the ceilings or doorways; floor tables (the low tables you use while sitting on the floor, rather than in a chair) will be tiny for him too! He might have to squeeze in a bit to get into some of the smaller outhouses as well... Outhouses in Keol tend to be fairly roomy for what they are, but not always. I know you’re trying to portray the language but the broken English is very jarring. Also the pure…well…the villagers are VERY annoying, almost evil. Has a sort of a view point of “the masses are naturally judgmental and closed-minded” sort of thing. Not that it’s bad, it’s just an interesting way to go about it. I have an opposite philosophy about the common man so it does feel strange for me, but as I read on I’ll get used to it. I think this is a cultural difference (which I, as the creator, am supposed to be getting across, so there’s definitely room for improvement on my part). Back when I was publishing this on Korean sites, I had some complaints/ criticisms but none of them had any issues with the way the villagers acted. It’s because it’s pretty much how they WOULD act. Not because they’re evil, but because they’re apprehensive of differences. That’s how high context vertical collectivist societies function. They’re not supremacists (though there are always exceptions, of course); they’re segregationists. Not in the “we don’t want to mingle with those icky outsiders” sense, but in the “it’s in everyone’s best interest that we separate, so we can all be ourselves” sense. Segregation is their way of letting people be themselves. This affects not only how they’re treating Ethan like a monster at first (that also has something to do with the fact they’ve never seen a white male adult… nor any human over 6′ tall), but also the way they treat Danbi. They don’t think Danbi as a bad person. He’s just Not One of Them. The reason they don’t want THEIR own kids to be like Danbi is because when you’re not One of Them, you usually can’t live among them — to the parents, it’s almost like losing their kid. (This is why suyoris don’t get married, which is explained later in the story. Suyoris are not a part of the normal society and cannot be married into a normal family.) They make fun of him to remind themselves that even though he may not be a bad person, he sure is a bad example to follow in their book.